Luxury sky view apartments next to Santa Claus Village, Rovaniemi, Finland. The main feature of accommodation is floor-to-ceiling windows with sky view and possibility to see the Northern Lights. Each apartment equipped with private sauna and outdoor heated jacuzzi. Location: 5/5 Snowman World is located at Santa Claus Village. Rovaniemi Airport - 3 km. Rovaniemi city and train station - 8 km. Recreational facilities: 5/5 Snowman World Winter Zone. Ice Restaurant. Restaurants with local food. Aurora safaris, snowmobile safaris and guided tours available. Comfort level: 5/5 Luxury glass igloo type accommodation with sky view. Private sauna, outdoor heated jacuzzi. Stylish Scandinavian design decoration. Style: 5/5 Modern and Luxury. More space in comparison with standard glass igloos. Scandinavian design and feel. The resort has 24 apartments. Each has privacy, sky and snowy landscapes view. Value for money: 4/5 Price from 496€/night. Finland - Lapland - Arctic Circle - Santa Claus Village - Rovaniemi. Superior Apartment with glass wall - 40m2. * Living area, mini-kitchen, bedroom upstairs with glass ceiling, sauna. * Outdoor Hot Tube / Jacuzzi. * 2 sleeps. Possibility for +2 extra beds (sofa-bed downstairs). Apartments decorated with Lappish handicrafts and Scandinavian design items. 1 bed-room upstairs with large window and glass ceiling. Extra beds for max. 2 persons (160 cm sofa bed) downstairs. Baby-cot available for rent (advance reservation needed). Each Superior Glass Apartment includes own heated outdoor Jacuzzi with forest and sky view. Other facilities: sauna, toilet and bathroom with Aroma Sense shower, hygiene products by Rituals, towels, slippers, bathrobes. Rates from 496€/night. During peak snow season from 696€/night. Husky Park (5 min walk). Rovaniemi airport - 5 km. Rovaniemi city - 9 km. Snowman World Glass Resort suits for short Lapland breaks as well as for longer winter holidays. No need to leave the place in order to try Lapland activities. Most of activities and experiences are located in 1 place within walking distance from the resort. Santa Claus Office is just around the corner from Snowman World resort. Open every day, both winter and summer. Entrance and meeting with Santa - FREE. No need to book time to visit Santa in advance. Using own cameras while meeting Santa is prohibited; professional photos and videos available for fee. Santa Claus Main Post Office address: Tähtikuja 1, 96930 Arctic Circle, FINLAND, just in the middle of Santa Village. Christmas products and souvenirs, cards and stamps, gift items can be found there. Post card can be sent straight away or before Christmas. All post will be stamped by hand using the special Arctic Circle postmark of the Santa Claus Post Office. There are plenty of souvenir shops at Santa Claus Village. Prices are reasonable and for some items (like magnets, postcards, etc) might be cheaper than at the Rovaniemi downtown. Unique souvenirs from Lapland: Shaman Drums, Marttiini knives, reindeer horns and other reindeer related products, Taigakoru jewelry, Lappish foods, berries and sweets, woollen hats and mittens. Next to the Santa Claus office (backyard) there is Santa’s reindeer safari track. Easy way to try reindeer rides. No advanced reservation needed. Path from 5 to 35 min (400m - 3km). Suitable for all ages. Price from 14€/child - 18€/adult. Husky Park is located next to Santa Claus Office (about 300m to the left). Open every day year round . Guided tour daily at 12.00 (duration about 0,5 h). Entrance fee: 10€/adult, 5€/child (4-12 years), family ticket 20€ (1-2 adults + 1-3 children). Rides with sled or summer carriage are available depending the weather. Short 500m and 2km rides without prior reservation and are non-stop. Husky rides prices are from 30€/adult, 15€/child + entrance fee. Snowman World Resort has a variety of fun snow activities for kids and adults. * Snow outdoor playgrounds in the Arctic Circle. * Real snowman characters to play with. * Sliding hills. Ice skating. Arctic Sledge, a Lappish sleigh-go-round. All equipment included. * Ice sculptures. Ice Restaurant. Ice Bar. Glass apartments are located in 9 km from the center of Rovaniemi. This is very special city of Lapland at any time and worth visiting. There you can find some attractions, activity providers, local food restaurants. Find out our recommendations what to do and what to see in Rovaniemi. The first point to come to Finland is Helsinki-Vantaa international airport. It has air connections with almost all countries. Airport is located about 20 kilometres from the centre of Helsinki. It has easy transport connection with the city. Helsinki stopover between the flights is great for visiting main sightseeing and do shopping. Helsinki Airport has train, bus, taxi or car connections with central Helsinki. Train-metro: Price is 5€. Every 10-30 min depending the time. Duration - about 30 min from central Helsinki (railwaystation) to airport. Finnair city bus shuttle: Price is 6,70€. Every 20 min. Duration - 30 min from central Helsinki (railwaystation, Eliel Square, platform 30) to airport. There are also some public buses available. Finnish Lapland is easily reachable from Helsinki by air, train or car. Rovaniemi airport is the biggest Lapland airport and it has daily flights from Helsinki and seasonal flight connection with some other European cities. By air: Helsinki-Rovaniemi daily flights by Norwegian and Finnair, 4 flights per day. Distance from the Airport to Igloo resort: 3 km (easy transfers by taxi). By train: Daily trains by VR from Helsinki to Rovaniemi. Distance from Railway station to igloo resort: 8 km. Santa’s Express Bus №8 leaves from the Rovaniemi railway station to Santa Claus village and Snowman world every hour / every day. As an romantic and stress-free option: comfortable night Santa Claus Express train to Rovaniemi from Helsinki. It is double-decker night train with sleeper cars. You can choose between compartment with shower and toilet, or compartment with common wc/shower. If you are travelling with kids, it will be fun adventure to come to Santa's home town by train (children under 7 can travel free if they share beds with adults). Train departs from Helsinki central railway station, which is one of the capital sights, at 18.49 and arrives to Rovaniemi at 07.15. We’d recommend to plan a trip to Lapland from end of November till mid April to get as much as possible from the trip. During this time there will be snow, and many winter activities run from end of November. * December and January is time for Polar Night in Lapland when sun does not rise above the horizon. It does not mean that there is dark all the time. There will be some kind of blue shining during a day and sun will be very very low, almost at the horizon line. For example, in Rovaniemi area sun rises for a couple of hours during the day time in December. 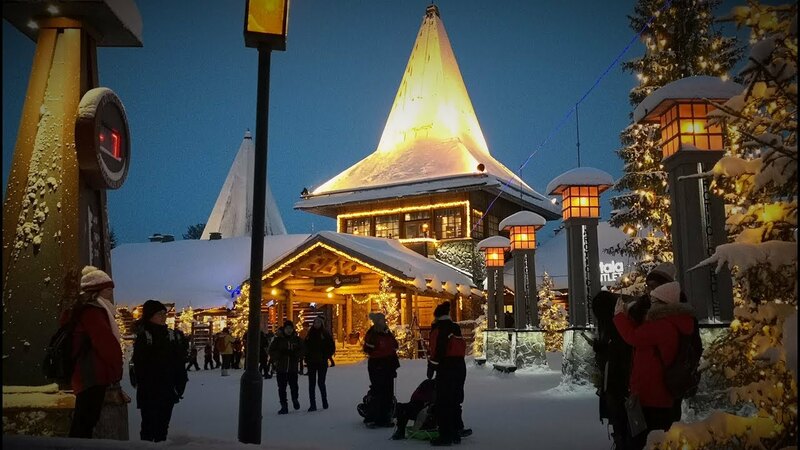 * Christmas and New Year time is very popular season in Lapland and especially at Rovaniemi area. People from all over the world try to get there during those 2-3 weeks. Travel companies book hotel rooms and cabins for their customers well in advance (1-2 year ahead). So if you plan your holidays for the same period, be prepared to see a lot of people at main attraction sites, book activities in advance to get available spots and pay more for accommodation as it is a high season. 1 night at Glass igloo and 1 night at Rovaniemi hotel (or vice versa depending on availability of igloos). We recommend to dedicate 1 full day to Santa Claus village. There are a lot of things to do and see in one place: Santa village and visiting Santa, activities at Santa Park, Husky farm, Ice bar and Authentic food experience. Next day you can choose from activities such as dog-sledding or reindeer safari, snowmobile riding, evening Northern lights safari, showshoeing, or visiting Arcticum museum in Rovaniemi.